Google+ (Google Plus) is a new social networking service from Google which competes head-to-head with insanely popular Facebook. Google+ was launced on June 28, 2011 as an invite-only testing phase. Initially, existing users were allowed to invite friends, though the ability to invite friends was quickly suspended due to “insane demand”. But how can a social networking service be a success if people who wants to use it has no way to sign up for the service, and cannot invite their friends to the same network? In fact, Google has failed to deliver in their previous social networking initiatives, including Google Buzz and Orket. Google seems to have a change of heart on Google+’s invite-only model though, as Google+ appears to be now on “open sign up” mode. It means that you just need to head to http://plus.google.com/ to join and activate Google+ account with a Google account. No invite is required. You need a Google Account (or Gmail account) to join, but you can easily create a Google account at https://www.google.com/accounts/, even though there is no link to sign up for new Google account from Google + homepage. 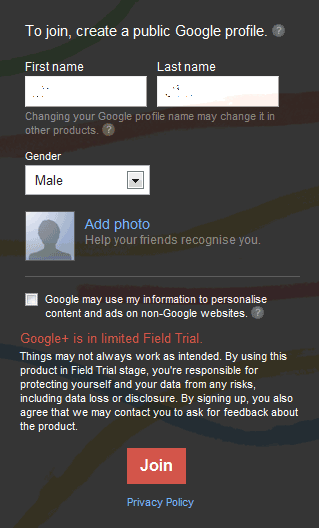 A public profile will be created in order to join Google+. And of course, existing Google+ users are now also having plenty of invites to send from their account, and thus regain the ability to invite their friends to Google+ network too. Note that you may or may not see the Google+ open sign up page (where you continue to see the web page with link to “Keep Me Posted” to send update when available). It’s probably a way by Google to offer sign up randomly to avoid sudden influx of registrations. So good luck and keep trying. Tip: You may need to logout from your Google account first before visiting plus.google.com to view the Sign In button. Else, just ask somebody who manage to register to send you an invite. Google+ has a few unique features which set it apart from other social network networks. Google+ features include “Circles” for organizing contacts into groups for sharing, “Huddle” for communicating through instant messaging within circles, “Hangouts” as places for facilitating group video chat, “Instant Upload” for storing photos or video from Android in a private album for sharing later, “Sparks” for searching, and “Streams”, which similar to Facebook’s News Feed or Wall for seeing updates from friends.